When I first considered creating a cuisine for my fantasy world, I debated whether or not my world would be kosher. In the end I decided that for my world to truly reflect my Jewish experience, it should be both kosher and not kosher. So food laws exist on Awan, but many Awan, like many Jews, do not follow them. In some tribes, like the Uriah, most tribal members follow the food laws, but in others, like the Sakhar, most don’t. Shrimp is not kosher, nor is any other shellfish, but that doesn’t stop it being from being a favorite in my household. It also happens to be a favorite of the Sakhar. Usually shrimp cakes, crab cakes, and other such dishes are made using bread or breadcrumbs as a binder or filler, and we could have used gluten-free breadcrumbs in this recipe. But since my husband is trying to follow a paleo diet, we decided to use cauliflower instead. Yes, cauliflower. I know, that sounds of another world, or you might even say…weird. I wish I had taken a photo of my son’s face when we told him, after he had inhaled half of what was on his plate, that the shrimp cakes were made with cauliflower. It only took a moment; however, for him to recover from his shock and continue diving into his dinner. According to him, these shrimp cakes are out-of-this-world. They really are delicious. I love that when I bite into them, I can taste the shrimp and not breading. 1. Break cauliflower into florets and pulse in food processor until it has the consistency of rice. 2. Heat approximately one tablespoon of olive oil in a large pan. Add cauliflower and stir well to coat with oil. Cover pan and turn the heat down to low. Sweat for 3-5 minutes. 3. Uncover the pan and continue to cook the cauliflower, stirring occasionally, for another three minutes, until softened. 4. In another pan, sauté green onion in olive oil until it just softens. 5. Pulse raw shrimp in a food processor until coarsely chopped. 6. Combine red and yellow peppers with the softened green onion in a bowl. Add the egg, coconut flour, sea salt, a few grinds of black pepper, and the shrimp. Mix well. Add cilantro and mix. 8. Form shrimp mix into 10-12 balls, approximately the size of a meatball (about 1½ – 2 inches in diameter). 9. Place a few shrimp balls in the pan and press gently with a spatula to flatten them to about ½-¾ inch thick, like a hamburger. It is important to cook these in batches to avoid overcrowding the pan. 10. Cook over medium heat until brown and crispy (approximately 3-4 minutes). Flip over and cook another 2-3 minutes. 11. 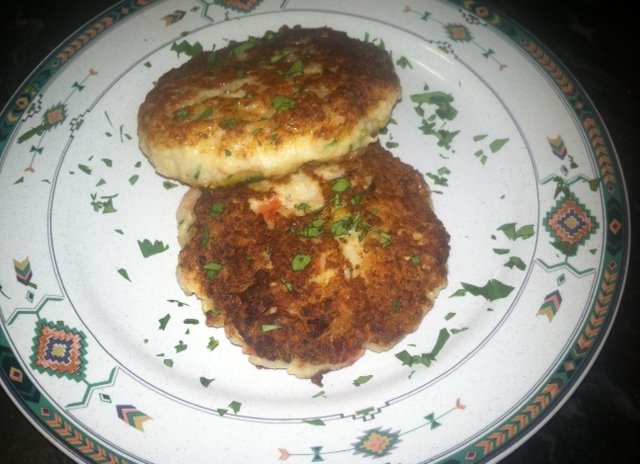 Place cooked shrimp cakes onto a paper towel to drain and repeat steps 9 and 10 until all cakes cooked. You can place the finished shrimp cakes into a 250° oven or toaster-oven to keep warm until you finish pan frying the other batches. 12. Serve hot with salsa or a flavored mayonnaise (chipotle mayo works well, but feel free to play) or save and eat cold (either in sandwiches with lettuce and mayonnaise or over a salad of mixed greens). Would these work with canned salmon? I bet that would work really well, Cathy! Mmmmm! Shrimp cakes! I remember the first time I saw cauliflower used for GF pizza crust or pitas I was “weirded out” lol but in time I kept seeing it come up in recipes and now it is one of my favorite ingredients. I am in LOVE with mashed cauliflower. But I hadn’t even considered having shrimp cakes in so long but now I am inspired. I will have to make these asap. I will let you know how it goes! Thank you for sharing to the Gluten Free Blog Hop! Thank you for inviting me to the Gluten Free Blog Hop! I know what you mean about being “weirded out” with using cauliflower in this way, it just doesn’t seem like it should work. But it does! Please let me know how it comes out for you.